We played this game last July with classic TV series and it turned out to be a lot of fun. This time around, we're opting for movie titles. 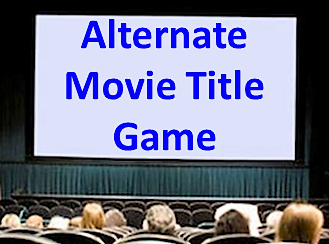 The rules are the same: We will provide an "alternate title" for a classic movie and ask you to name the actual film. Most of these are pretty easy. Please answer no more than three questions per day so others can play. Good luck! 1. Pursuits of a Bird Head Covering. 2. Departed on a Breeze. 3. Type of Candle Drawing Fop. 4. A Large Distance Under a Large Body of Water. 5. The Personal Happenings of Liz and X. 6. An Astronomical Object Comes into Existence. 7. The Terribly Frightened Trees. 8. Timepiece on the Part of a Melon. 10. The Secret Agent That Got Nice and Toasty. 13. The Chess Piece's Spouse. 14. Everything You Wanted to Know About the Night Before Christmas. Thanks for getting this game off to a good start! Well done! Are these too easy? You’re right on #12. Per below, 8 is WATCH ON THE RHINE. Certainly the funkiest alternate title.,,kudos for getting it! You are correct on all three! #5 The Private Lives of Elizabeth and Essex. Remaining questions to be answered are 3, 7, and 14. Nice job on both of them, Toto! And with that right answer, that wraps up this game. This is a fun game. Thanks for your effort in setting it up. We'll look forward to Volume Two.